Go behind the scenes of Alexis Bittar's studio, courtesy of New York Magazine. 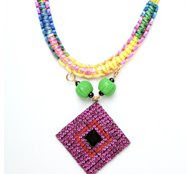 One of my favorite fashion jewellery designers, Bittar's designs are trend conscious and ultra modern. I love this behind-the-scenes video snippet featuring the making of the Lucite bangle, an Alexis Bittar signature. On newsstands today, Harper's Bazaar Runway Report. A special issue, this side publication was intended to be an extension of Harper's Bazaar and is chock-full of everything runway. The book will be divided by city and designer and will be full of highlights from each runway show unable to be featured in it's mother book. The new mag will be a whopping 220 pages, 81 of which will be advertisements. On newsstands until November 1st. 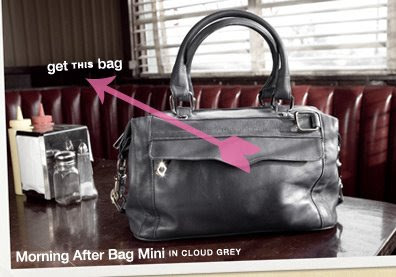 Lookout for Botkier's new fall hit, The Morgan. This fringed hobo will be all the rage come time to store your Havaianas. Get yours now and be ahead of the season. I love the grape, bronze and black version but my favorite is the grape. Who needs another black bag? I'd rather step out of the black puddle and into some color come fall. One of my favorite fashion editorials is Highlights from Milan, Harpers Bazaar, July 2008, edited by Katie Mossman. Hilary Rhoda looks great. The fall collections inherit all the qualities of a stellar season. Rhoda breathes life into the clothes in a spectacular ethereal way that makes you want to go out and buy every single piece (save for the furs). Above all, I think that the hair is just fabulous. You will be sure to find me with these tear-outs at the salon come time for my fall (hair) makeover. C'N'C Costume National introduces a new way to wear the ubiquitous head scarf. Instead of folding it, try twisting it. 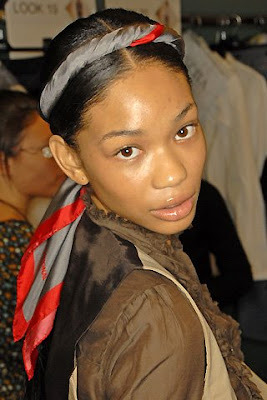 Way more stylish than its predecessor, the twisted head scarf gives the headband look a whole new feeling. A great new style update. I never quite imagined myself writing about a staircase but then again the staircase I discovered is not your average pinewood suburban staircase, rather it is the spectacular glass staircase new to the Victoria & Albert Museum in London. 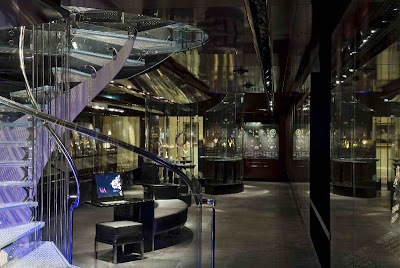 The spiraling glass structure connects the two floors that make up the museum's new jewelry gallery. Named after it's soul benefactors (who gifted the museum with $14 M), The William and Judith Bollinger Gallery was designed by Architect Eva Jiricna, with the intention of upping the ante on display standards. Not only is the gallery a magical diaphanous jewel box, it is a multi-media experience like no other. The gallery is sprinkled with rotating images and computer screens making the experience truly interactive. This "crystal palace", as marked by the International Hearld Tribune, is an awe-inspiring experience of glass, crystal, glitter, and shine, as the extensive collection of 3,500 jewels, some dating back 800 years, literally, gleam off the walls. For those who can't make the trip to London to visit the gallery, the book published to mark the opening of the gallery, Jewels & Jewellery, may suffice. Anyone can tell you that I am the furthest away from being even a smidgen of an Eva Mendes fan. However, I am not afraid to admit (even if I'd rather look the other way) when someone looks dashing or not and Eva Mendes for Calvin Klein Underwear looks rather dashing. The fall/winter 08-09 campaign, shot by Steven Miesel, introduces the Company's new line of underwear, Seductive Comfort, a line promising a new level of fit, support and comfort, and may I add, an underlying sexiness, not so often apparent in Calvin Klein Underwear. Eva does look good in these ads but my favorite CKU model so far has been Natalia. New handbag line worth checking out, West Feren. Named after her grandmothers, designer Alison Pawling, resorts back to her memories of her mentors for inspiration for her line. Launched in fall 2007, West Feren is a tight collection of leather handbags that are functional, practical and yet femininely quirky (all bags boast a splash of color). 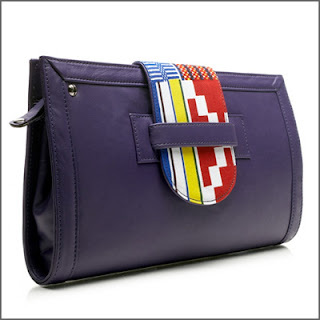 My two favorites are the Stone Town Clutch in Royal Purple ($269.00) and the Portland Clutch in Bright White ($279.00). According to CNBC, Tinsley Mortimer, a permanent fixture on New York's social scene, is considered - The Modern Socialite. Mortimer, the socialite turned entrepreneur, is a working girl. She is not a just a lady who lunches but one who earns her own money. Mortimer, a descendant of Thomas Jefferson, known for her philanthropic efforts, her preferred charities include, Memorial Sloan-Kettering Cancer Center, the Natural History Museum, and New Yorkers for Children, has her own handbag collection under the Samantha Thavasa brand, and her own clothing collection, Riccimie, exclusively sold in Japan. Ms.Mortimer also has a Dior Lipgloss named after her, called Tinsley Pink. Apart from fashion, she has been hired as Lifestyle Director for a new New York luxury condominium. She is to lend her branding power to the new development and advise the developers on layout designs, amenities packages and décor. And you will always find her front and center at the circuit of fashion shows during New York Fashion Week. Is Tinsley Mortimer on the way to Tory Burch status? I think beyond. Model.Live - the new model reality show to hit, no not your TV, but your PC. Vogue and IMG have teamed up to create, an as-real-as-it-gets model reality series based on three models as they work through New York, London, Milan and Paris fashion weeks. The show will air on vogue.tv starting August 19th. Check out this sneak peek of what's to come. Stay tuned for the Rachel Zoe clothing line, the Rachel Zoe Fragrance, and the Rachel Zoe Reality Show. Contrary to my earlier post about Rachel Zoe still at Halston, rumour has it that the Creative Consultant, hired to give her two (style) cents has been outed from the company. And the plot keeps getting juicer. Who will remain? Who will be brought on board? What will happen to Halston? As if a plain gold metallic heel wasn't enough. Leave it to Christian Louboutin to design this fantasy, rocker inspired skyscraper. Exactly one year after being hired as Halston's Creative Director, Italian designer, Marco Zanini has been booted out of Halston. Zanini designed the revived house's first collection to mixed reviews. Halston is now on the hunt for a new Creative Director. Harvey Weinstein, Tamara Mellon and Rachel Zoe still remain with the company. Can the House of Halston ever be revived to what it was in its Studio 54 heyday? The verdict is out and the pressure is on to live up to its glamours iconic reputation. To view the fall 2008 runway collection, visit halston.com. Check out the latest collection for Rebecca Minkoff for fall 2008 at shopbop.com. The ever-so-popular, The Morning After Bag, is a must-have for everyone. So if it's not already in your closet, then you should make it a point to add it to your fall shopping list. Check out the Shop Bop exclusive Rebecca Minkoff video and view the collection at shopbop.com. The trendy, swoon-worthy jewelry label, Erickson Beamon, has joined the "Collaborative Movement" and joined forces with the Urban Outfitters (UK) to design an exclusive collection for the mainstream retailer. Styles run the kooky side, with bright neon colors, and rhinestone and plastic mixes. The collection will be available later this month on urbanoutfitters.co.uk. In 2002, Vivia Ferragamo, the granddaughter of the late Salvatore Ferragamo, launched her own collection - Vivia. The collection, including ready-to-wear and accessories, will finally be available stateside come fall 2008. Look out for her chic leather ballet flats. 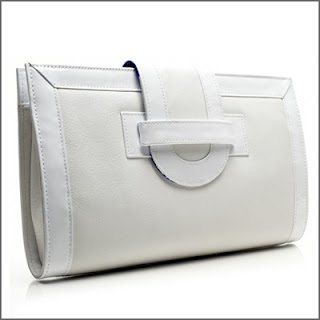 For retail availability and more info on Vivia Ferragamo, visit vivia.co.uk. Helmut Lang, who departed from fashion in 2003 has not let his creativeness wane. He made the crossover to artist and will be unveiling his first solo exhibition at Germany's "Hanover Goes Fashion" festivalon on August 31. Well not exactly author, however, if you didn't get a chance to get your hands on a Chloë Sevigny for Opening Ceremony piece (her second collection for Opening Ceremony...sold in over 100 boutiques...and pretty much sold out), you can catch glimpse of it in this cheeky flip book. The book, recently released en mass, is available for those interested in spending $65 to get a artsy look inside the world of Sevigny. 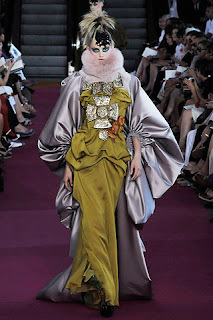 Be sure to visit gucci.com today at 2:00 P.M. E.S.T to view the Gucci Cruise 2009 Collection web cast live from Rome. As part of its 70th Anniversary, Gucci has decided to take its Cruise collection to Via Condotti, one of the city's most infamous streets. 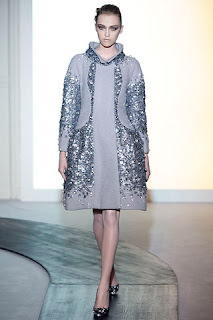 When it comes to couture collections, everyone is always so fascinated by the clothing. 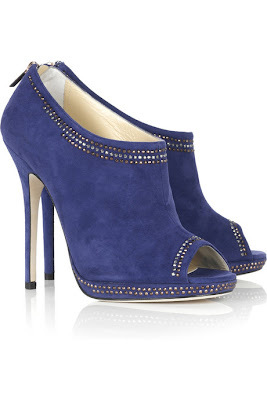 They are always ready to pick, scrutinize, fuss, and be in awe of the looks but my personal love is of the shoes. 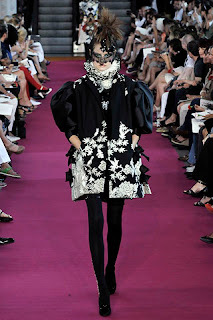 It is all about the couture shoes and my favorites this season are Christian Dior. The blunt bob at Chanel Haute Couture fall 2008. This was a new kind of couture show for Valentino, one without Valentino himself. 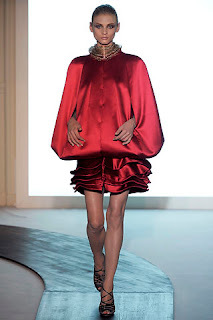 It was the first time designer, Alessandra Facchinetti has touched couture. Not only does she have the pressure to fill the shoes of a legendary designer, she has to fill his couture shoes as well....not an easy feat. It is nice to see fresh blood take on such a heavy-laden role of Haute Couture designer and it will be interesting to watch her couture career. The first collection was not stellar to say the least, out of the 36 looks only 5 made my favorite list, but the first usually never is. 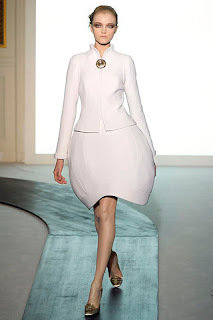 It was grown-up, ladylike, sophisticated and serious with a definite lean toward the futuristic vibe. With inspiration from the '50s, John Galliano produced a fall 2008 Couture collection that was seemingly constrained, nevertheless, ethereal and fantastical. 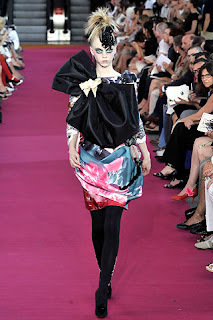 It was so constrained, and toned down (for Galliano) that one poses the question of wearability. You may think that this collection is completely wearable but when given a closer look, it begs to differ. 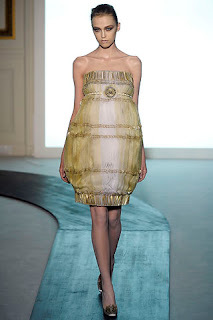 The "Galliano Exaggeration" that ran rampant throughout the 45 looks definitely makes one question the wearability. 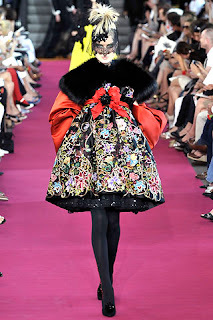 Yet, this is why we love Galliano for Christian Dior, it would not be so special nor so anticipated of a collection if Galliano would give us wearable.